Twentieth-century Jerusalem is doubly divided. As well as being a holy site for both Judaism and Islam, the city contains secular Israelis and Palestinians who ground their respective national identities within its borders. 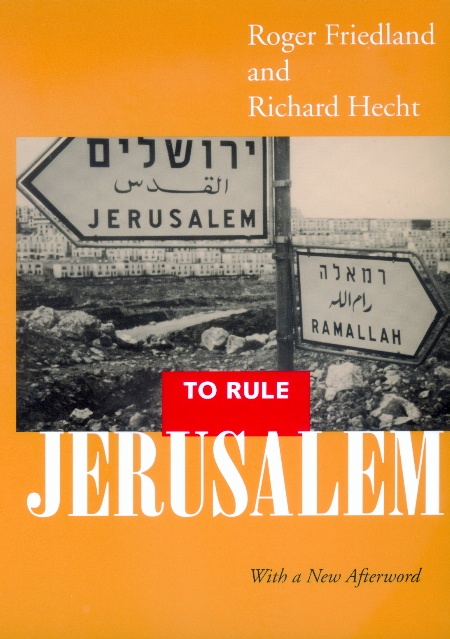 To Rule Jerusalem provides a historical and ethnographic account of how Jerusalem has become the battleground for conflicts both within and between the Israeli and Palestinian communities. Roger Friedland and Richard Hecht examine the relation between Zionism and Judaism and between Palestinian nationalism and Islam. Based on hundreds of interviews with powerful players and ordinary citizens over the course of a decade, this book evokes the ways in which these conflicts are experienced and managed in the life of the city. To Rule Jerusalem is a compelling study of the intertwining of religion and politics, exploring the city simultaneously as an ordinary place and an extraordinary symbol. Roger Friedland is Professor of Sociology and Religious Studies at the University of California, Santa Barbara. Richard Hecht is Professor of Religious Studies at the University of California, Santa Barbara.